This navy colored velvet bag is designed with golden pomegranates and silver leaves as a corner design in the bottom right corner. The pomegranate fruit is an important symbol in Judaism. Among the many different things the pomegranate fruit represents is that it is one of the Seven Species of fruit and grain which are enumerated in the Torah as special products of the land of Israel. The pomegranate fruit is a symbol of fruitfulness and eaten on Rosh Hashanah. 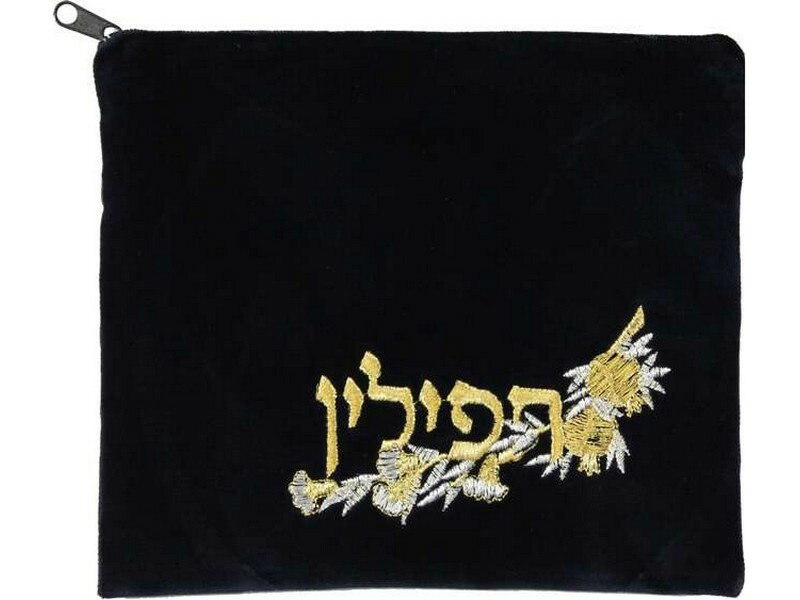 The Hebrew word “tallit” or “tefillin”, depending on what size/style is selected is embroidered with gold colored thread on the design.